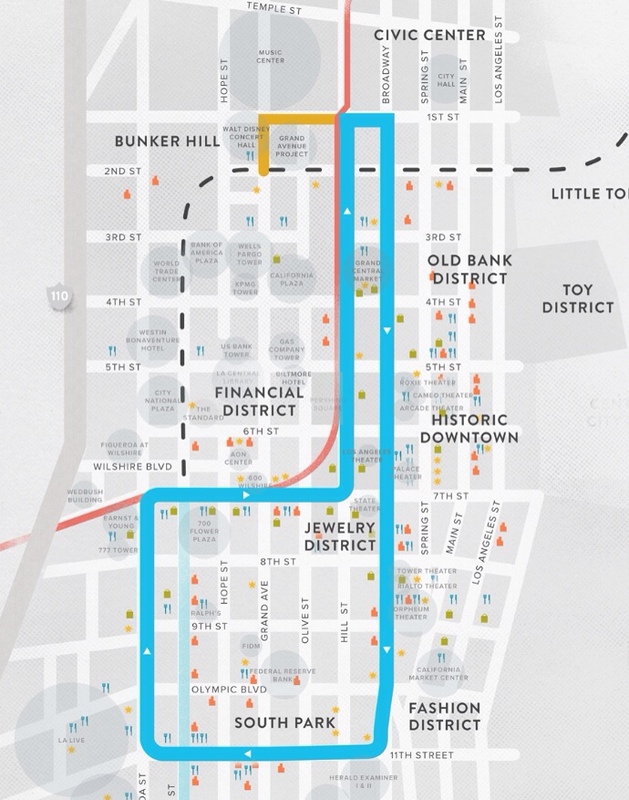 Downtown property owners voted to approve a new special tax district to help fund a streetcar (project home page here). The tally of ballots — all mail-in — finished a few minutes ago with 73 percent approving of the district according to the city of Los Angeles’ unofficial count. The money raised from the new tax will be used to attract the federal grants needed to fully fund the $125-million project. The streetcar in Portland that inspired many similar projects served as the funding model. The proposed route is above. There will be easy connections to the streetcar from the Red/Purple Line subway, Regional Connector, Silver Line and many Metro bus lines. The goal is to open the streetcar in 2015 with construction beginning in 2013. Congratulations to L.A. Councilman and Metro Board Member Jose Huizar and his staff for spurring the streetcar project. I think it will prove to be a tremendous benefit for many downtown neighborhoods and especially good for Broadway, a street with a lot of great old buildings and a lot of potential. and community college seats held last May, turnout has been less than 10%. returned to the City Clerk in time to be counted on December 3, 2012.
streetcar effort through his Bringing Back Broadway initiative. capitalized interest, bond issuance costs, reserve fund, and other costs. the remaining construction costs for the project. just 6.7% in Los Angeles County. parking ticket that can be avoided by using the streetcar. streetcar line, as opposed to 53 percent citywide. Seattle, St. Louis, and Washington DC. would run up onto Grand Avenue to serve the city’s cultural institutions. The streetcar would run seven days a week, approximately 18-hours a day. or cyclists with their bikes. bond. They will not increase or require renewal. running through Downtown as early as 2016. Learn more about the Downtown L.A. Streetcar project at www.streetcar.la. Metro may have found another way to fund their projects. I would pay for a transit line if it improved my neighborhood. I won’t support a general Metro tax increase because Metro returns pennies on the dollar to my neighborhood. Century City, Beverly Hills, Westwood, Santa Monica, Beach Cities, all very wealthy neighborhoods. I’m sure they could help accelerate their transit lines themselves if they wanted. How are the operations going to be funded? Also the City council documents indicate the special tax could be asses up to 40 years. Seems to me people have been playing fast and loose with how much this thing is going to cost without providing a full plan. This thing was a boondoggle from the start and now a minority of residents decide to commit DTLA landowner for 40 years. The first line is incorrect, it was Downtown residents, not Downtown property owners. amazing news. Bringing back broadway is going to bring dozens of jobs and more life back into downtown. I love this city. I think its great that DT will have a street car; However, I don’t understand why the property owners were not allowed to vote. Property owners can pass the cost to their tenants, IF the market could bear the addition cost. Will tenants pay a higher price to be within walking distance of the street car? Maybe. Maybe not. Still not correct: Residents who are registered to vote within the proposed district boundaries. Need more non-bus options in 7th St east of Broadway.